Even as critics complain the company has lost a step, Apple’s profits keep climbing. The company released its fiscal third-quarter earnings report on Tuesday, reporting revenue of $37.4 billion and a net profit of $7.7 billion—a record June quarter for the company. For the 2014 third quarter, Apple earned $1.28 per diluted share, up from $1.07 a diluted share the company earned in the year-ago quarter. 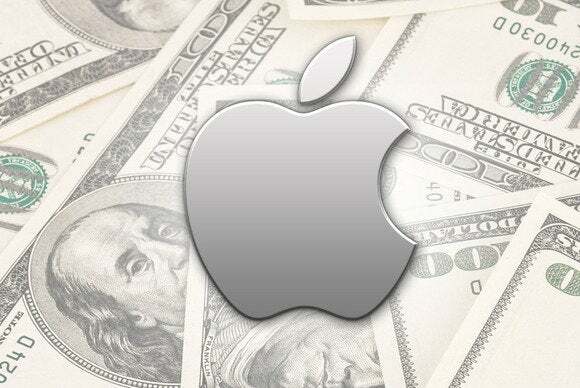 Apple has declared a cash dividend of $.47 per share of the company’s common stock. The earnings somewhat underperformed Wall Street’s estimate of $37.99 billion in revenues, though the per-share earnings exceeded the $1.23 forecast by analysts. Apple CEO Tim Cook cited 26 percent revenue growth in China as a specific driver of the company's record-setting quarter. "China honestly was surprising to us," he said. "We thought it would be strong, but it well went past what we thought." Sales of the iPhone were up year-over-year: 35 million units were sold—a third-quarter record—generating $19.75 billion in revenues, compared to 31.2 million units generating $18.1 billion a year ago. Cook specifically cited growth across the entry-priced, mid-tier, and lead iPhone categories—a slap, perhaps, at those who've called the mid-range iPhone 5c a failure. 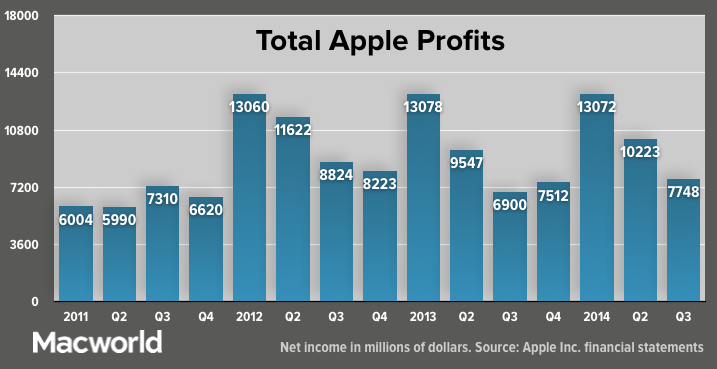 Sales were down from the second quarter, though, when Apple sold more than 43 million iPhones and generated $26 billion in revenue; unit sales dropped 19 percent since then. The third quarter, though, came later in the iPhone 5s and 5c product cycle, when attentive phone-owners begin anticipating the fall release of Apple’s as-yet-unannounced next iPhone model. Despite a shrinking overall market for PCs, it was also a record June quarter for Mac sales—driven by a strong MacBook Air line—with growth of 18 percent, year over year. 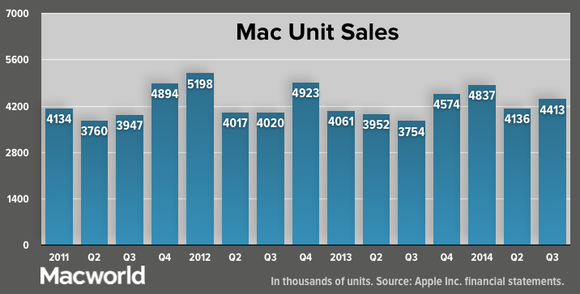 (Macs have gained PC market share in 32 of the last 33 quarters.) 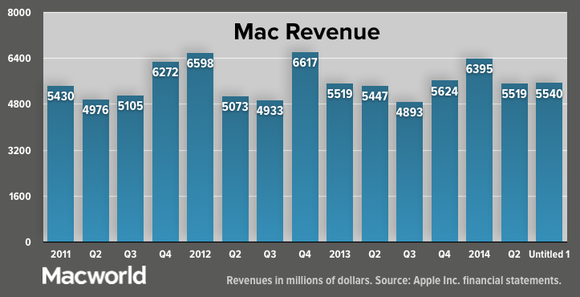 The company sold 4.4 million Macs during the quarter, up from 3.7 million units in 2013. 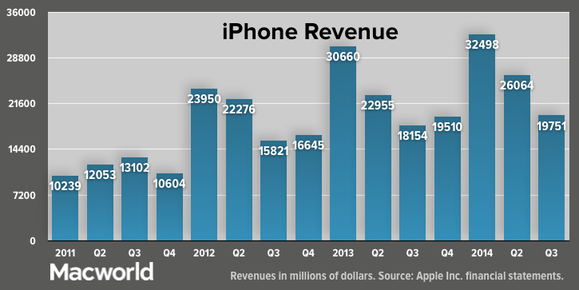 That translated to a 13 percent revenue increase since last year’s third quarter, to $5.5 billion from $4.9 billion. 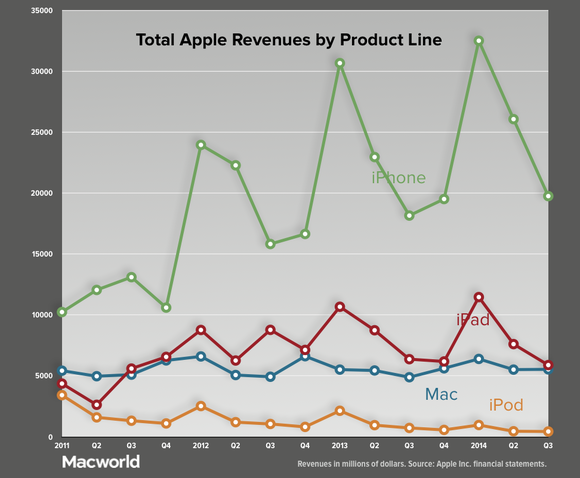 The units sold also increased over second quarter 2014, though revenue was somewhat flatter: Apple saw a 7 percent increase in Macs sold from the previous quarter, from 4.1 million units, but also generated $5.5 billion in sales during that quarter. The iPad, however, remained the second-biggest seller among Apple's product lines—but showed perhaps the biggest weakness among the company's major products. 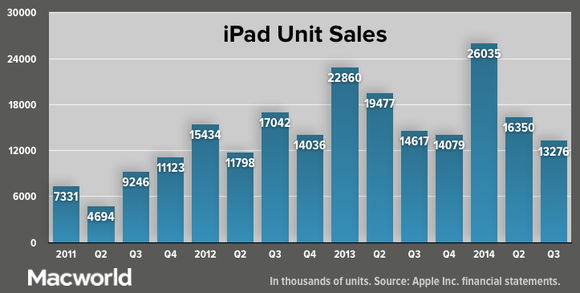 Apple sold 13.3 million tablets during the quarter—down from both the second quarter, when 16.3 million units were sold, and from the third quarter of 2013, when 14.6 million units were sold. 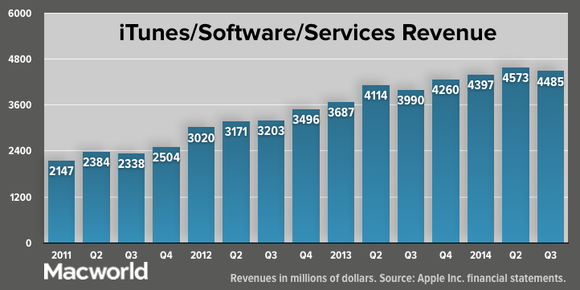 Revenue declined by 8 percent, year over year, from $6.4 billion to $5.9 billion. 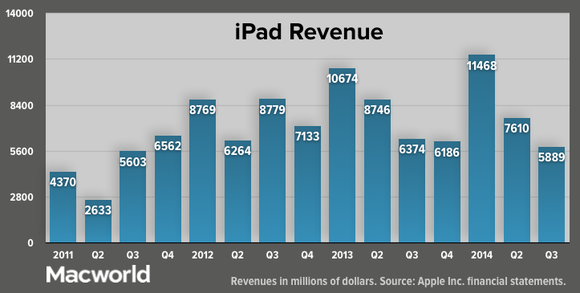 "The iPad's sales met our expectations, even though I realize they did not meet yours," Cook told financial reporters on the conference call. He added: "We still feel the category as a whole is in its early days, and there's also significant innovation to be brought to the iPad, and we plan on doing that. When I look at the top-level numbers, I get really excited when I see that more than 50 percent of the iPads we're selling are going to first-time tablet buyers." 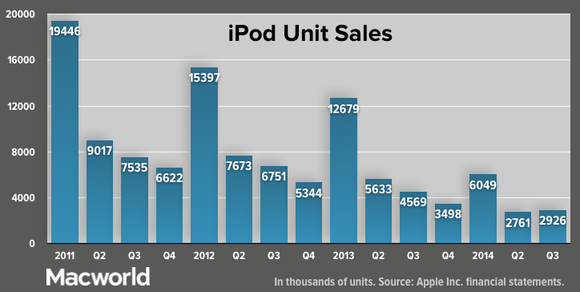 The iPod line, while much diminished from its heyday, showed a small resurgence. The company sold 2.9 million units during the quarter—down from 4.6 million units a year ago, yes, but up 6 percent from the second quarter sales of 2.8 million units. 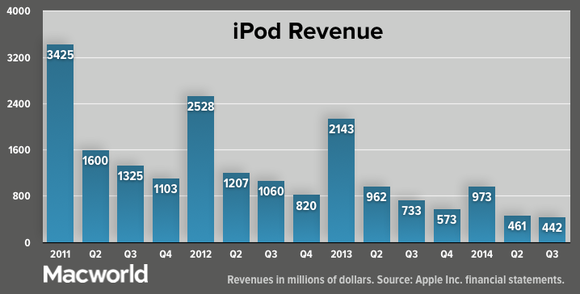 That’s still small enough, though, that iPod revenues are measured in millions instead of billions: $442 million in sales for the third quarter, down 40 percent from $733 million a year ago. The company generated $4.485 billion from iTunes, software, and services—up 12 percent from 2013, when revenues were $3.99 billion, but down 2 percent from the second quarter 2014, when the sector generated $4.573 billion. Officials said the rise was driven by a growth in app sales through iTunes and the Mac App Store: Total lifetime downloads from the App Store now exceed 75 billion. Finally, Apple sold $1.32 billion in accessories during the quarter, up 12 percent from $1.18 billion a year ago, but down 7 percent from $1.42 billion in the second quarter of this year.